John H. "Jack" Fairbanks Jr. 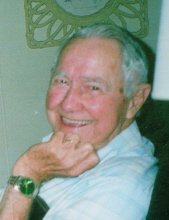 Celebrating the life of John H. "Jack" Fairbanks Jr.
Obituary for John H. "Jack" Fairbanks Jr.
John Henry “Jack” Fairbanks, Jr., 91, of Shelbyville, IL passed away at 12:30 a.m. on Sunday, April 7, 2019 at Shelbyville Rehabilitation and Health Care Center in Shelbyville, IL. Lockart-Green Funeral Home in Shelbyville is assisting the family. John was born June 7, 1927, in Decatur, IL, the son of John H. and Myrtle (Godwin) Fairbanks, Sr. John was a United States Navy veteran of WW II and a United States Army veteran of the Korean War. John and June Clemons were united in marriage on July 29, 1950 and were blessed with 68 years of marriage. John worked for the US Army Corps of Engineers in the early 70’s, helping to build Lake Shelbyville. He was an over-the-road truck drive until his retirement in 1990, was a member of the Shelbyville VFW Post #4829, was the lead singer in several country bands and enjoyed time spent with family. Per John’s wishes there will be no services. Family and friends are invited to light a candle or share a story in John’s honor at www.lockartgreenfuneralhome.com. To send flowers or a remembrance gift to the family of John H. "Jack" Fairbanks Jr., please visit our Tribute Store. "Email Address" would like to share the life celebration of John H. "Jack" Fairbanks Jr.. Click on the "link" to go to share a favorite memory or leave a condolence message for the family.